My CNY Mommy: Thomas & Friends 3 DVD Set Play Date Pack Giveaway! 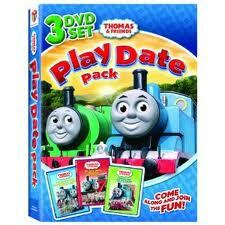 Thomas & Friends 3 DVD Set Play Date Pack Giveaway! "Well, Bust My Buffers!" Thomas & Friends - Thomas & Friends Play Date Pack from HiT Entertainment and Lionsgate landed in-stores on April 5th! Join Thomas and his friends on their adventures on the Island of Sodor, from the television series! Thomas teaches about friendship, loyalty and cooperation in this DVD set. Thomas and the Jet Engine: All the engines on the Island of Sodor work very hard to keep things running smoothly on Sir Topham Hatt's railway. But even with all this hard work, sometimes unexpected things can happen. Who would have guessed that Thomas would rocket past the proud and fast Gordon, thanks to a surprising push from a jet engine? Join all of your friends on the Island of Sodor as the go full steam ahead with some great adventures. On Site With Thomas: See Oliver's exciting discovery at the construction site for the new school and help the team decided who is the most important engine! Can Kelly save Isobella, and see who is hiding in the forest? All Aboard for nonstop excitement with Thomas! Thomas & the Really Brave Engines: Adventures abound on the Island of Sodor for Thomas & Friends! It's Thomas to the rescue as Fergus breaks the rules and learns a very valuable lesson. Is there a monster lurking in the misty valley at Castle Loch? Twin engines Donald and Douglas find out! Come aboard for all the fun! Again, great effects and a great story for the kids! Thomas & Friends Play Date Pack is here (April 5, 2011) just in time to hop into the Easter basket of your Little Thomas & Friends fan! One MyCNYMommy reader will win this 3 DVD Play Date Pack! *To enter, comment below telling me which lessons you like that Thomas teaches children AND Enter on THIS FORM! Thank you to Lionsgate for my sample used in this review and for the winners prize. The opinions expressed are of my own. I like ALL of the lessons that Thomas teaches, he has been a great role model for my boys. I like that it teaches kids not to be in a hurry to do things. That it's about taking the time to do things right and the slower way in the end. I love that is teaches my boys to always help others, no matter what! I haven't watched very many, but I do like their friendships and how they always help each other. I like the vocabulary they use. They use words that people don't typically use anymore (i.e. he was cross) and I've heard my son use some of these words. I like that it teaches kids to help others and work together. I like the fact that Thomas teaches them to admit when they do something wrong. Thomas is a staple in our house and I love how Thomas teaches to own up to things when he makes bad choices. I like CNYMOmmy on Facebook! I am a folloer of CNYMommy on Twitter! I want Thomas to teach my daughters how to be brave especially in the dark. I like that Thomas teaches children patience! !